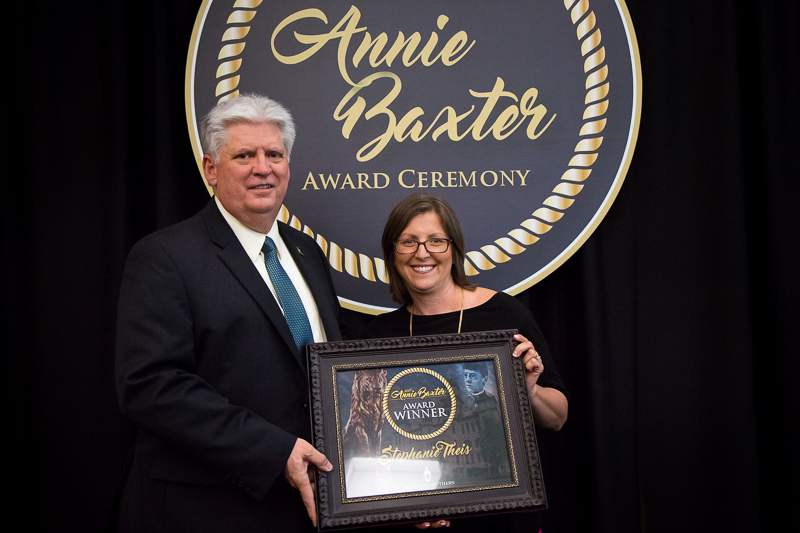 Stephanie Theis, the executive director of the Children’s Haven of Southwest Missouri, was named as the 2017 recipient of the Annie Baxter Award during a ceremony held May 3 at Missouri Southern. Theis was nominated for the award by Jasper County Circuit Clerk Melissa Holcomb, who praised the nominee for the “grace and excellence” she brings to her work. “Stephanie, during her 23-year career in social work, has strengthened support for children during vulnerable times,” said Holcomb. A graduate of Carthage High School, Theis received her degree in sociology from Missouri Southern State University and her master’s in social work with a family health concentration from Missouri State University. She has served as facility director of the Elm Acres Youth Home and as a child services specialist, forensic interviewer and forensically sensitive therapist with the Children’s Center of Southwest Missouri. She is a member of the adjunct faculty at both MSSU and MSU. Theis said the work at Children’s Haven – which provides a safe, temporary home to children of families during times of crisis – wouldn’t be possible without the dedication of the organization’s staff. “And as a graduate of Missouri Southern, it’s such an honor to be here and be supported by so many people,” she said. Barbara Hogelin, who has served for nearly 20 years as Joplin’s City Clerk. Melodee Colbert-Kean, president of the National League of Cities and a Joplin City Council member since 2006. Eileen Nichols, founder and market master of the Webb City Farmers Market. The event, which included remarks by Dr. Alan Marble, president of Missouri Southern, was emceed by Dr. Ree Wells-Lewis, head of the university’s Social Sciences Department. Nicole Shoaf, professor of political science, gave a presentation on the legacy of Annie Baxter.